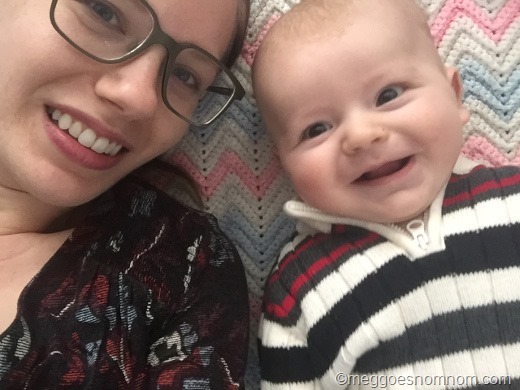 Our little cutie is six months old! 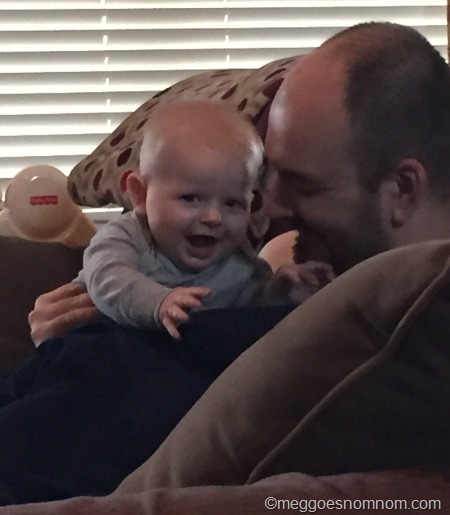 It seems like every couple days we have a new “first” around here, and it’s so fun seeing Jack reach new milestones. 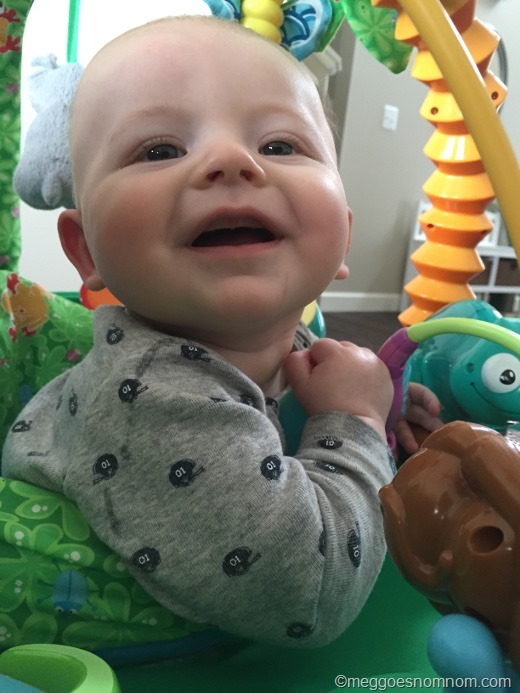 He was in the 97th percentile for length at his last doctor’s appt! Right now at six month’s he’s about 17.5+ lbs and 28” long. He’s a big guy! His eyes are still dark blue and his hair seems to be coming in in blonde patches! In the next few months we’ll find out what his true eye and hair colors will be! I’m so curious to see if he’ll keep the blue eyes and blonde-ish hair! Sitting up on his own! 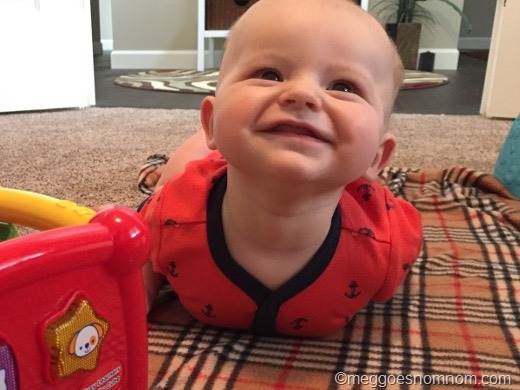 If we place him in this position he can sit up on his own for several minutes at a time and play with toys. First solid food – see below for deets. I returned to work in January after being off for 4.5 months. I’m now working four days per week while Jack goes to daycare (I reduced from full-time so I would have an extra day to spend at home with Jack). He’s doing really well (finally started taking a bottle! [NUK orthodontic bottles ended up being the winner, FTR]), just picking up lots of bugs this cold and flu season. It was hard to leave my baby behind at first but it feels good to be back to work and it’s made me savor the time we do get to spend together even more. February included birthdays for both huz and I. We celebrated with a couple outings – to the Creature Conservancy in Saline and the conservatory at the Matthaei Botanical Gardens in Ann Arbor, both with Jack. And lots of tasty take-out meals! 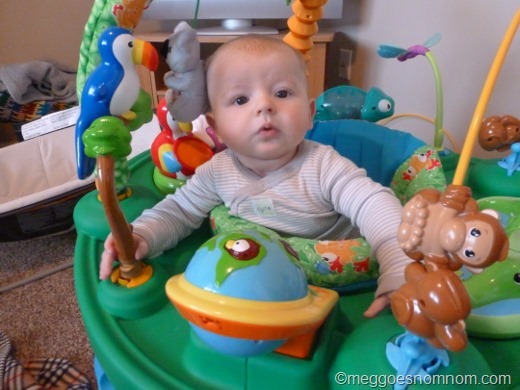 Playing in his Exersaucer. I bought this used from Craiglist and it was worth every penny! It’s like new and he loves it. Rolling all over the house! He really can get around these days. I think we may have a crawler sooner than later. He can pretty much do a 360 when laying on his blanket and flops back and forth from back to belly and belly to back. Smiling! He is SUCH a smiley little guy! Is this not the sweetest face you’ve ever seen? 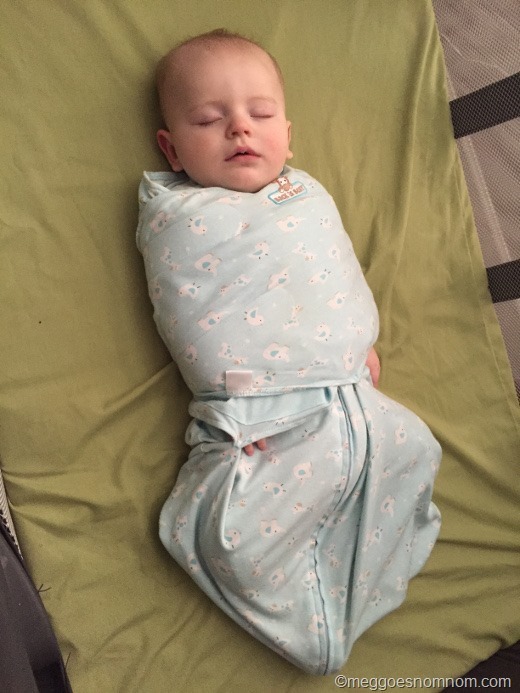 Being put into his SleepSack for naps or bedtime. For some reason this is just torture to him! Poor guy! Once he’s in, he’s fine, but the process of getting there is not his favorite. Having boogies wiped off his nose. Saline drops in the nose. Basically just leave his nose alone and he’ll be happy. He never has been and still is not a great sleeper. He usually takes four 30-45 minute naps per day, though lately sometimes one of the naps will last 90 minutes. We’d love to transition to two longer naps per day but Jack would not, apparently! He usually goes to bed between 7:00-8:00 PM and gets up between 5:00-6:00 AM. He wakes anywhere from two to four times per night (sometimes even more on a really rough night) and needs to be fed and or/rocked to get back to sleep. We probably need to enact some sleep training around here and work on breaking his sleep associations but the huz and I are both softies and can’t bear to leave the nugget in his crib crying. But the sleep situation is simply exhausting and frustrating most nights. In his Pack ‘n’ Play in our bedroom is where Jack still sleeps, mostly for my convenience. It’s much easier to pick him up and feed him when he’s only two steps away versus down the hall in his room. At some point we’ll move him to his crib in the nursery. Occasionally he does take a nap in his crib. I think he pay have stayed in our room longer than average but I’m a strong believer that everyone just needs to do what works best (and safest) for their family. I can’t believe we made it to six full months (and counting) of exclusive breastfeeding. I feel like I deserve some kind of medal. I honestly feel like this is one of the biggest accomplishments of my life. Breastfeeding is not easy and I’ve made a lot of sacrifices to continue doing so all of these months. We breastfeed when we are together and I pump at work and send bottles of milk to daycare. Jack still has a huge appetite and feeds frequently throughout the day. My growing boy! 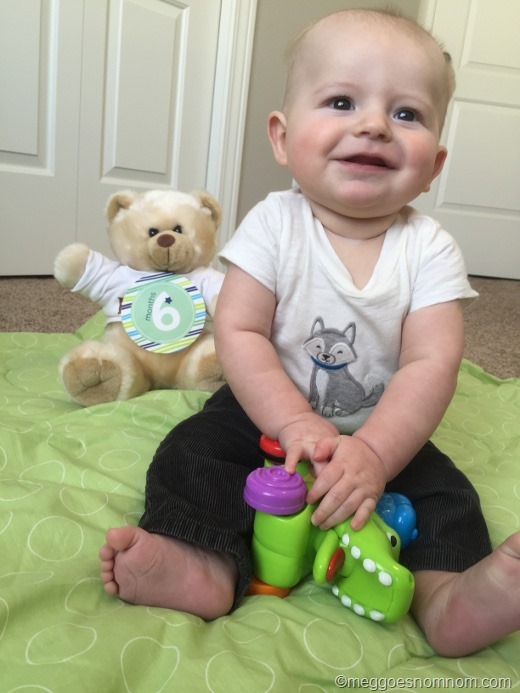 Per our pediatrician’s recommendation, we waited until Jack was six months of age to introduce solids. 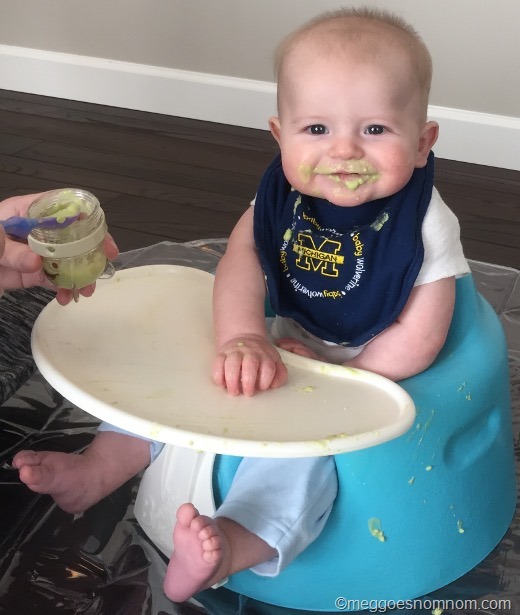 His first food was avocado and he loved it! Seriously, he was way more into it than I expected! I have a Baby Bullet that I have been using to make simple purees. So far we’ve only done avocado and bananas, but I look forward to expanding our repertoire soon (sweet potatoes, pears, apples, and peas coming soon!) His first meal was in his Bumbo but will be assembling his high chair soon!